Located at 156 Front Street North in Downtown Sarnia. Mapquest map. Exit Highway 402 at the Front Street exit . Head South on Front Street until you see the side of our building with the large train mural. Take Exit 1 to Front Street. Turn right. Take either Highway 40 North or the river road until you are on Vidal Street. Head north on Vidal Street to Wellington Street. Turn left. Continue west to Front Street. Turn right. 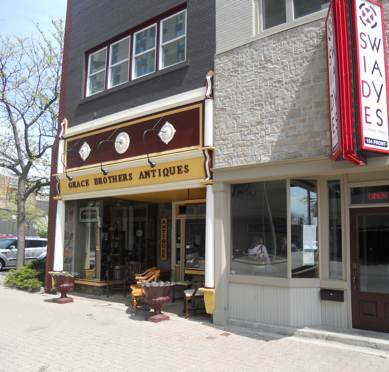 Watch for Grace Brothers Antiques on your left hand side (3 blocks ahead). Travel into the downtown (about 1 km) and you'll find us at 156 Front Street.